Too lazy to make coffee? You’re in luck. Colgate’s designed a toothbrush that releases caffeine as you brush. It could also dispense meds, Benzocaine for teething infants, or an appetite suppressant, says the company. Or it could simply deliver groovy taste sensations. But don’t race over to Walgreen’s just yet: this invention isn’t released, but it is filed with the U.S. Patent Office. 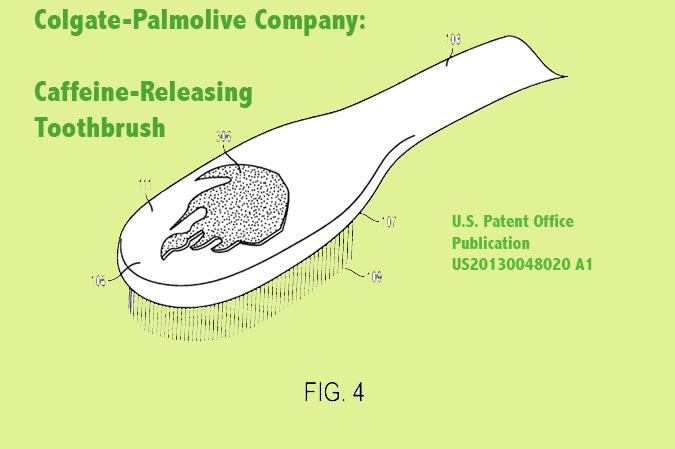 Colgate-Palmolive’s plans show a patch on the brush, designed to slowly release a substance with repeated uses over time. Each patch would visually indicate its function – such as flames for cinnamon, a leaf for aloe vera, or (my favorite) a lightning bolt for tingling sensations. Zap! The material could be released in several ways – by abrasion, temperature swing, a change in pH or by dissolution. While consumers may seek to clean their tongue or teeth, there has not been a toothbrush which provides a chemical sensory response in a mouth to enhance a user’s brushing experience. Further, consumers have not been provided with a visual method to select a toothbrush which provides a sensory response. Hence, there is a need for a toothbrush that provides a biochemical sensory effect when in contact tissues of the mouth and supports a method to visually communicate the sensory effect to a user prior to use. So I wonder…If kids can develop cravings for caffeinated sodas, could they also get addicted to caffeinated toothbrushing? Who knows: there may be an upside to Colgate’s contraption, and a boost for those who really need to work on their oral hygiene. Click to see patent diagrams and application for Colgate Palmolive Company’s Oral Care Implement No. US 20130048020 A1.